Nowadays everyone wants to hold a high-end mobile which should be both good at playing games and fulfilling all multimedia requirements. People before buying a mobile thinks whether they are buying a good model or not. Many people regret buying a phone which is high in price but less in specs and also not durable. That thing simply hurts a buyer when he makes this kind of mistake. If you are thinking which mobile you should buy then there is one, buying it you will never regret that you buy a bad product while think that you have invested in right mobile for yourself. Sony xperia Z1 and Z ultra are the two best phones that you can buy in the price of 40,790 and 42,890, these phones will offer you great entertainment with top hardware configuration. Even buying these phones you will get some accessories free. Besides that these phones are both water and dust resistant. It is the USP of these mobiles on which you can pocket out your money. There are many other models too which you can buy. 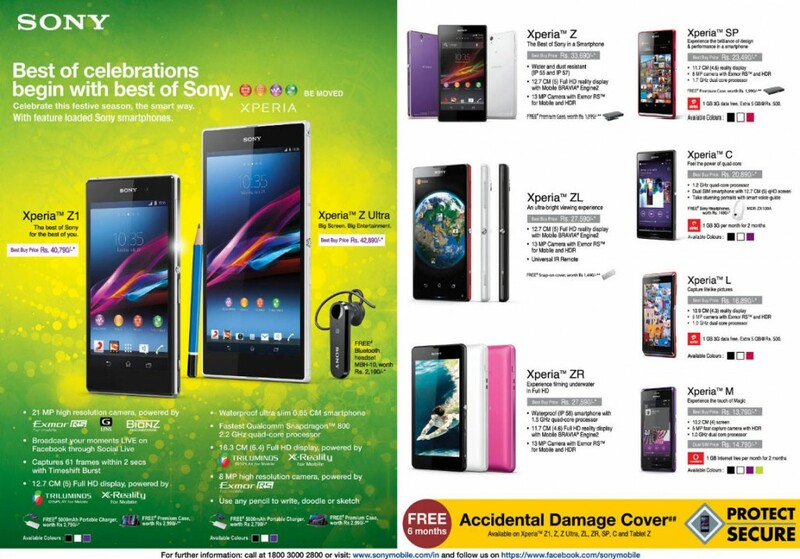 Buying Sony xperia phones you will get 6 months accidental damage cover on selected models including Z1, Z, Z ultra, ZL, ZR, SP, C and tablet Z. So it is the great offer that you can grab and if you grab early will get secure 6 months accidental protection.